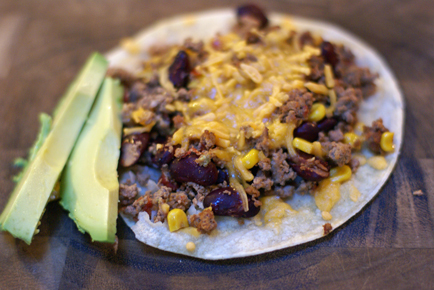 I found this taco meat (similar anyways…this time I added canned corn and canned tomatoes to the taco meat) in the freezer…and in less than 15 minutes, I had dinner on the table. I found corn tortillas in the freezer. I found shredded cheese in the freezer (for Steve’s taco pizzas). I found an avocado in the fridge. That’s all I needed. Here’s the recipe for the gold. Make the taco meat. Brown the ground beef, drain and return to the skillet. Add the beans, corn, diced tomatoes without their juices and homemade taco seasoning. Season with salt and pepper to taste. Place the corn tortillas flat onto a lightly greased baking sheet. Top with the taco meat, then the shredded cheese. Place in a 350 degree oven for 10-15 minutes, or until cheese melts and edges of corn tortillas begin to crisp. Serve Taco Pizzas with sliced avocado. Squeeze a little lemon or lime juice over the top for some zip. This recipe looks really simple and delicious. I think I have most of the ingredients in my pantry and fridge right now. Thanks! This recipe is so simple yet so awesome!!! I fixed them for dinner last night and guess what my kiddo wanted for lunch today!! Definitely on the keeper list! !